I didn’t think that it was physically possible to get an injury from chocolate. I was wrong! I was just minding by one business and tucking into some lovely Toblerone. (Admittedly it is one of the world’s most difficult and dangerous chocolate bars to eat). This evening, while watching TV, I went to break off a piece and trapped my thumb between two pieces! Ouch! It’s so thick that with the pressure, due to my eagerness, it suddenly cracked together. Result = one sore thumb! The only other option to eat this chocolate is to try biting a piece off. That can often result in the next piece poking up your nose. 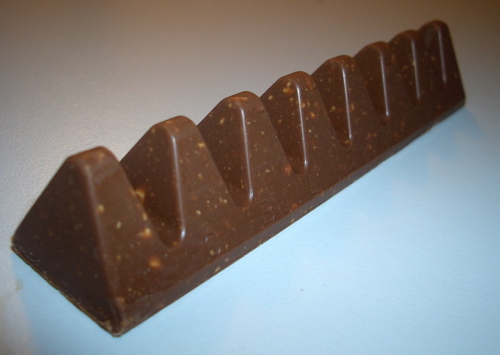 Just what were the Swiss thinking when they invented this chocolate bar? This entry was posted in Blog, Food, Funny, Life, Random and tagged blog, Candy bar, Chocolate, Confectionery, food, Funny, Humor, Humour, injury, me, memory, odd, Random, Switzerland, Toblerone, Types of chocolate by jamieonline. Bookmark the permalink. The Alps are painful, Lou. I call it a labor of love to eat this candy bar, but it is SOOOOOOOOO GOOOOD! It’s so easily done, trust me. I wish you an injury free future of chocolate devouring. Milk chocolate all the way! Yum!! !